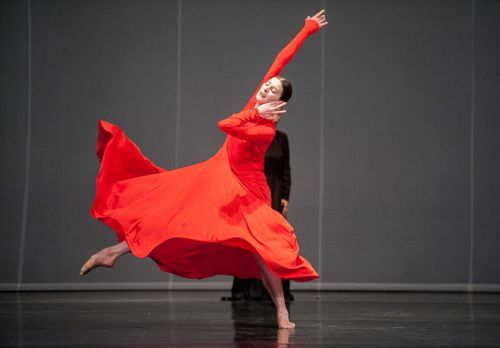 The Paris Opera Ballet, in its determined non-classical guise, closed its New York visit with the late Pina Bausch’s 1975 Orpheus and Eurydice. In a post-modern, glossy-mag décor, Bausch’s take on the subject mingles the ravishing dancers with the solo singers, giving Terpsichore’s favorites little better to do than undulate their supple spines (ladies), run and jump (gentlemen), and (all) make the same gestures, many of them mindlessly co-opted from Martha Graham, again and again. And again. In the house program, Bausch assigned each element of the deeply touching myth her own “intellectual” meaning. Her most grievous act, however, was to chop up and rearrange Gluck’s sublime music. I did appreciate Stéphane Bullion’s physical endurance as a strangely sulky Orpheus and joined in the burst of acclaim that Marie-Agnès Gillot earned for her magnificent dancing as Eurydice. Brevity is the soul… Thanks for all we needed to know. It’s not just Graham, it’s Wigman and Jooss. Yes, “… again and again. And again.” You are so right, but when did Pina Bausch ever develop choreographically the movement themes she posits so provocatively and at times powerfully? Perhaps only in one work, her “Cafe Mueller,” in which the characters switch motion phrases giving them new accents. As for what influenced her “Orpheus and Eurydice,” I suspect that it was not specifically America’s Martha Graham or even Germany’s Mary Wigman and Kurt Jooss but the Middle European choreographers of the Jaques-Dalcroze line, people like Valeria Kratina and Rosalia Chladek, who re-invented the classical chorus for early 20th -century stagings of the GraecoRoman plays. I am as struck by TT’s elegantly articulated prose as I am by Gillot’s ditto foot in the photograph above. It’s quite startling, that image, the foot of a ballerina seen bare of pointe shoe.